About this time of year, many of us begin to feel that we look dull. Brightening up the area around the eyes is the best way to look refreshed and vibrant in a snap. 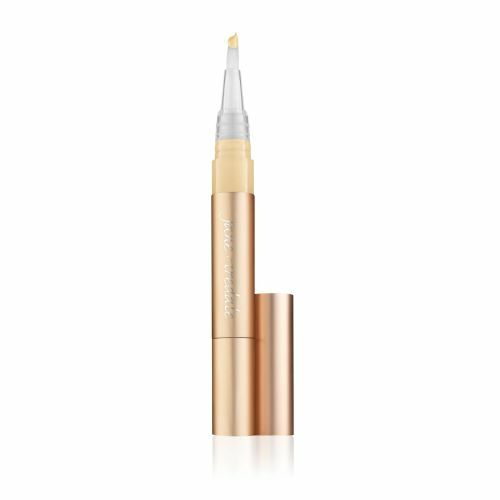 Active Light Under-eye Concealer is great for banishing dark under-eye circles and bringing light to the face. It has a light formula that feels fresh on the skin, and the built-in applicator makes it easy to use. The formula refracts light to create a soft focus effect. It provides sheer to medium coverage, so if you need something super-emolient or for heavy-duty coverage, Circle/Delete Concealer is a better choice. For the basics of applying concealer to hide under-eye circles, follow the tips here. A little goes a very long way. I am amazed at how little I have to use! If it is creasing, it was too much. Just pat at the concealer with your ring finger to smooth it out and use a little less next time. Experiment (it’s only makeup!) till you find the right amount for you. If you have a few extra fine lines around the eyes, *sigh* start applying just a little bit down/away from your tear duct. Somehow those rascally little crinkles are worse right under your eye, and are best avoided altogether. You will get the same lightening/brightening effect with fewer opportunities for accentuating fine lines. The inner corner of the eye, on the side of the bridge of the nose is a GREAT place to add light. It wakes up your eyes and brightens your whole face. Remember the corners of the nose, around the nostrils. If you have any redness there this is the #1 trick for creating a flawless-looking complexion. Active Light is a great highlighter for the tops of cheekbones, down the center of the nose, top of the cupid’s bow of the lips (luscious!). Plus one from our friend Karen: dab a little at the outer corners of the eyes to lift and refresh. Thanks Karen! If you want to read what others say about Active Light, you can read some tips and reviews here. Do you have any tricks for combating under-eye circles, or highlighting and brightening the face? If so, please feel free to leave a comment below! Value and Versatility: Now That’s Beauty! thank you, this is my #1 concern! Hi Karen, How could I have forgotten the outer corners of the eyes! I am adding it above, thank you! Such a great and versatile product!!! It also helps keep the corner of my lips from cracking and chapping! I love this product, however, I stopped using it as it made my under eye area “slippery” (even when I applied powder over top) and my mascara would smudge all over the place. Any tips? Hi Lindsay, Are you using eye creams before you apply Active Light? If so, this may be the culprit. Also, a little goes a very long way. Try applying the least amount possible and build up coverage till you are happy with it. Please let me know if this helps! ugg sale, like most other issues of today, began with a dream of one man. That man was Paul Van Doren and his dream to produce and sell ugg boots directly to the public. Paul Van Doren basically started making running shoes when he worked in a factory on the east coast. He has also worked with people who have had experience in small business to create UGG Boots. They were Jim Van Doren, Gordy Lee and Serge Unfortunately, none of them really had no experience in retail. Despite the setback just managed to open its first store in 1966 on March 15. It was the first Vans shoe store was located on an incredibly 704 East Broadway in Anaheim, California. At this point, they only offered three styles of ugg boots cheap. They were the price, but they were sold as a display only uggs. Day 1 was really open, they have 12 clients. Due to the fact that basically a lot of Discount Uggs, customers were asked to return later in the afternoon and then rushed to our plant and in each selected Boots. There was a slight problem. When each of the 12 people came to pay for their new products ugg boots to change, and because none of their party, in essence, retailers expect this meeting, so that customers have given their ugg boots and asked them to return later and pay. Fortunately, they were eating, all 12 of his clients were good honest people who actually go to pay for their ugg boots.